3. How to find out the length of your own hair? 4. Find out the length according to the body part? 5. 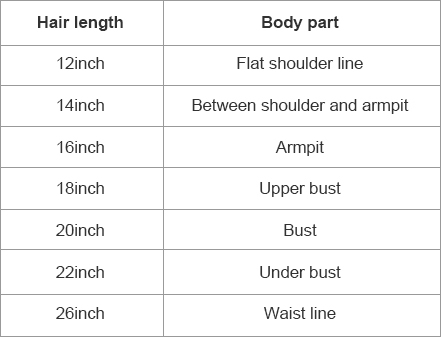 How to choose the length of the hair extensions? 6. How to choose the weight of the hair extensions? You should measure the hair starting from the top of the head to the bottom tip. 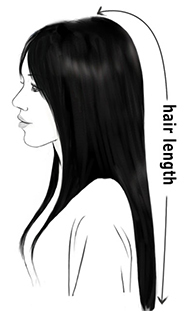 (Note: If your hair is curly or wavy then measure the hair length after straightening. Usually curls will make your hair length shorter by 2~4 inches). 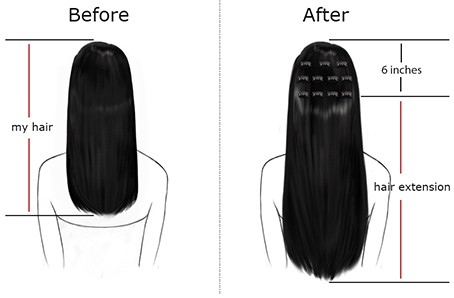 No matter how long your hair is, clip in hair extensions should be worn from the top downwards, around 2-6 inch; therefore if the length of the extension is N inch, the whole length will be N + 6 inch. If your own hair is medium thick or much thicker, or if you want to have a fuller final appearance, medium and high volumes are recommended to you. 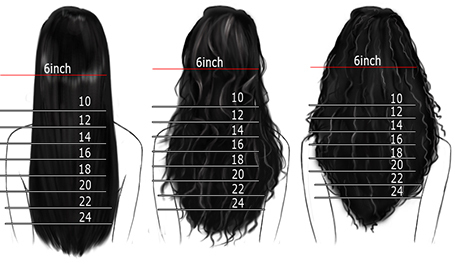 The super sizes (such as 30"-300g and 32"-320g) will be provided to meet your demands for super big/long hair. So far, our customers' satisfaction of the medium and thicker volumes are 100%. But 20% of our customers, who purchased our low volumes, hold that the thickness is not enough or the ends are a little thinner. If you are not sure about the proper weight or wanna have other irregular sizes, free to contact our customer service (service@Vpfashion.com). Kind Reminder:During the package and transport, the hair loss is difficult to avoid. Therefore, it might be possible that the weight does not meet to 100% of the specification. 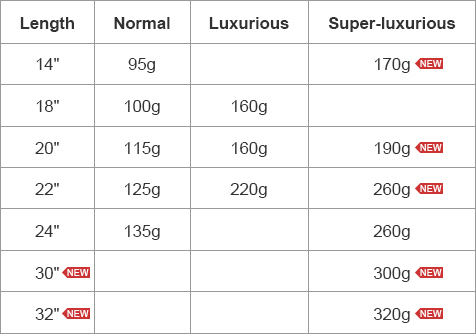 10 to 15g gram loss more or less is not quality defect. 1. My payment is not going through? 3. How do I add a promo code? 4. I entered my promo code but it didn't work? 5. Can I make changes to my order? 6. Do you offer a wholesale program or distributorship? At checkout, make sure that all of your personal information matches the exact information (name, address, etc.) associated with your PayPal account or credit card. If some information doesn't match, the transaction will not go through. If you are unsure, please call your card company to see what information they have on file. If the problem persists, please e-mail us at service@Vpfashion.com with the set (color/weight/length/texture) that you would like to order, as well as your shipping address, so that we can e-mail you a custom invoice for your order and enter your order manually. We accept payment by PayPal,Credit Card, Western Union, Money Gram, and Bank Transfers. When you place an order, you will see a box on the shopping cart page where you can enter your promo code. The promo code and discount will appear immediately and be added to your order total. The promo code must be redeemed at this point in the ordering process; it cannot be applied after the order has been processed. Only one promo code can be used per purchase. Our system will always recognize valid promo codes. Therefore, if the discount has not been deducted from your order, the code was incorrectly entered. Promo codes can only be redeemed during the placement of orders and cannot be applied or amended once the order has been placed. 1.We can change the color or style for you in the case of not damaging the hair quality, but $20 dyeing fees and $10 styling fees are needed. 2.If you want to change other information such as length and weight, we will charge you extra or credit back the overcharge for any price differences of the change. NOTE:We will do our best to make the change, however we cannot guarantee that we will be able to do so, as there are varying time limits in which we are able to do so. 4. Do you ship internationally and shipping address issues you may know! 5. What are your shipping rates? 6. Not receive the package? Once your payment has cleared, you will receive an e-mail when your order has been processed. You will also receive a second e-mail once your order has shipped which will include your tracking number and a link to check the journey of your Vpfashion hair extensions.You can also check the status of your order on My Account. If you have any additional questions, please contact our customer service team. Once your order goes through, you will receive an email with your order confirmation within 24 hours. Most of the orders (e.g. : #613a DIY orders, ombre/highlight orders, colorful orders, flash sale orders, tester orders) will take 2-4 working days. A few special orders (#22, #24, #613 , yaki texture orders, special type/irregular size orders) will take 15-20 working days. Wig orders will take 30 working days. We are off duty on weekends/legal holidays and all the orders are processed only on working days. Once your order is ready to ship you will receive an email notification with shipping info as well as a tracking number. You can track the shipping status with the tracking number on DHL or FEDEX website. Once shipped, please allow 2-3 business days to receive your order via DHL/Fedex. If you prefer a particular courier, please leave a request when making your order. We do not have overnight shipping and we ship Monday through Friday, excluding weekends and holidays. If you have a deadline, feel free to tell us the exact date in fear for the delay. To Ensure The Safety Of Your Package, Please Write Down The Correct Shipping Address Without Any "P.O. Box", "Box", "APO", "FPO" And Etc., Which Seems Like Military Address. If You Only Have One Address, Including "P.O. Box", And Etc., Please Write Down Your Specific Street Info. The Delivery Time Is Around 7-15 Working Days. If You Are From Brazil, Please Write Down Your CPF In The "Additional Request" Part When You Place An Order Or Email US. If You Are From Some European Countries (Sweden, Uruguay, Norway, Denmark, Slovenia And Etc. ), Please Remove The Special Symbols Above The Letters. Note: We Will Not Start To Prepare Your Order Until The Shipping Address Is Totally Correct. So, Please Try To Provide Correct Shipping Address For Fear Of Delaying The Estimated Delivery Time. We use DHL/FEDEX on all orders and charge a $18 flat rate. Once orders have been shipped out, we will update order status in system, you can have a check in your account. If you haven't received the package 10 days after your order has been shipped out, please e-mail us immediately. We will contact with related logistics company to have a check to help you receive the package asap. Otherwise, we will not accept claim for refund or compensation, etc, because logistics record will be unavailable when time past a month. Hope you can kindly understand. 1.Email service@Vpfashion.com within 48 hours after receiving your package to make an application of exchange. Emails received after the 48 hours will not be taken into consideration. We will send a reply email within 24 hours. Notice: Please return the hair extension to us within 8 days after you receive our return address. Or we will not accept any returning or refund. 3.Before shipping back, please email us first for the return shipping address, which is totally different from the previous one used to send off your order before. We have every right to refuse for the package if you send it back without our permission. 4.Normally, Vpfashion always has a strict quality inspection before the delivery (including color, length and hair texture confirming). What's more, after receiving the hair, we will make you an exchange or refund if you have some subjective complaints such as considering the color doesn't match or color is different, and will not charge you for the restocking or shipping fees (we pay when ship to you). However, if your order is ombre, balayage or colorful hair extension, $20 will be required for the dyeing fees. Wigs customized according to your requests and Tape-In Extensions are considered FINAL SALE items are not eligible for refunds, returns and exchanges. 5.We will charge you extra or credit back the overcharge for any price differences of the exchange. 6.Be sure to have a safekeeping for the card with ordering information (Order Number, Product SKU, Hair Color, Texture and Length) written and put that card together with the hair extensions in the returned package. 1.Email service@Vpfashion.com within 48 hours to make an application of return. Emails received after the 48 hours will not be taken into consideration. We will send a reply email within 24 hours. 4.Normally, Vpfashion always has a strict quality inspection before the delivery (including color, length and hair texture confirming). 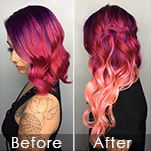 What's more, after receiving the hair, we will make you an exchange or refund if you have some subjective complaints such as considering the color doesn't match or color is different, and will not charge you for the restocking fees. But $20 will be charged for shipping fees (we pay when ship to you). Besides, if your order is solid, ombre, balayage or colorful hair extension, $20 will be required for the dyeing fees. We will refund you the remaining payment in 3 working days after verifying the return package. 5.Be sure to have a safekeeping for the card with ordering information (Order Number, Product SKU, Hair Color, Texture and Length) written and put that card together with the hair extensions in the returned package. Yes, you may cancel your order before the order goes into processing by contacting us by e-mail at service@Vpfashion.com..
You must contact us before it goes into processing. If your order is already processing or has been shipped, we will NOT be able to cancel or modify any orders. If you do not contact us in time to cancel your order, you may still return it, once you receive it, as long as the Return & Exchange Policy has been followed, also we will charge you for dyeing fees ($20) or shipping fees ($20).